A monument commemorates the 50th anniversary of the end of World War Two. These two concrete tetrahedrons of "tank traps" formed part of the Belmont Anti Tank Ditch which streched in a straight line from this site to the sea. The ditch was a major defence installation constructed by army and civilian units in late 1942 as the southern perimter defence of the Port of Newcastle. At the time it was anticipated that the Japanese may attempt a beach landing between Belmont and Swansea Channel. The ditch was designed to prevent enemy tanks proceeding north to Newcastle. 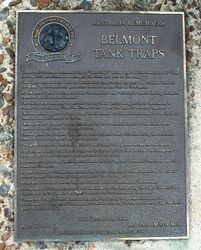 It replaced the winding Cold Tea Creek which linked the lake to Belmont Lagoon. Two interlocking rows of tank traps were located on the southern bank of the ditch to obstruct the movement of tanks. Twenty seven acres of dense scrubland to the immediate south of the ditch were cleared to deny cover to enemy forces. Timber posts or Dumble Tank Stops were located every five feet along the northern bank of the ditch. Many are still in place. The posts formed a vertical barrier to any tanks tht gained access to the ditch. The bridge nearby was built of timber. In the event of attack it could be collapsed quickly into the ditch by the withdrawal of five bolts. An extensive post and barbed wire beach defence system extended from Redhead to Swansea Channel. Jungle training of troops was conducted in the forested Jewells area where the sand dunes ranged from twenty to one hundred feet in height. Army establishments were located at Blacksmiths, Jewells and Gateshead. As the Allied Forces advanced northwards in the Pacific during 1943 and 1944 so the importance of the beach and port defences of Port Newcastle receded. 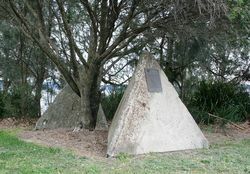 These tank traps or tetrahedrons stand as testimony to the determination of Australians in the face of danger to which this region was exposed during the dark days of World War II.